Low working volume means fast exchange times. Expression of recombinant receptors in oocytes has been a favorite choice for researchers to assess the pharmacology of recombinant receptors. Since the oocytes are 1-1.5 mm in diameter, however, fast solution exchange around the oocyte was difficult. 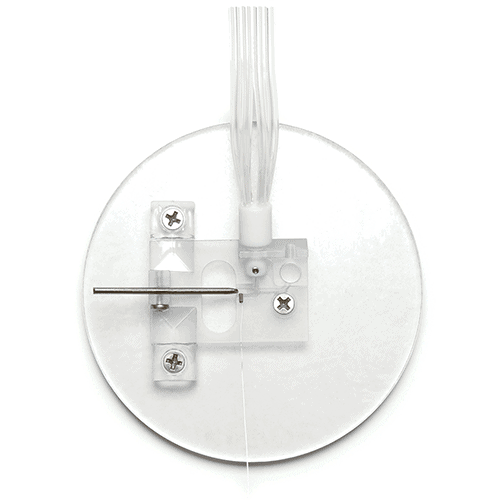 After several years of electro-physiological research, we have designed a Xenopus oocyte perfusion chamber for use in automated and unattended experiments. Combined with an automated perfusion system, this chamber allows researchers to obtain dose-response data quickly and easily. Chamber dimensions: 45 x 30 x 10 mm.